Do you enjoy a little chamomile tea before bedtime? If so, you're not alone, as this herb has a long reputation for encouraging a restful sleep. The benefits of chamomile go way beyond helping you snooze, however. In fact, this herb is as soothing for the skin as it is for the spirit. 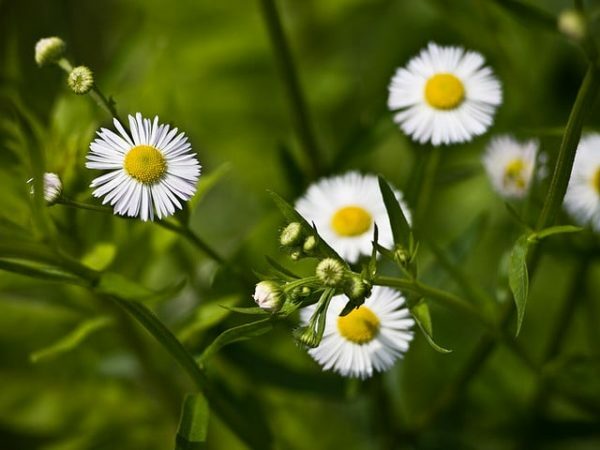 This daisy-looking flower helps soothe and calm skin. Chamomile is a common name for several daisy-like plants in the family Asteraceae. It grows to about three feet tall and blooms in June and July with small fragrant yellow and white flowers. It's easy to grow and you may see it in fields and gardens, as well as along roadsides and other drier areas. Stomach upset: Because of its antispasmodic properties, chamomile can help calm and soothe stomach and intestinal cramps, even those caused by PMS. It's also said to help relieve excessive gas and bloating, as well as irritable bowel syndrome and nausea. Mouth sores: So far we're missing large-scale studies, but when used as a mouthwash, chamomile may help prevent mouth sores. Boost immune system: A 2005 study found that after people drank five cups of chamomile tea daily for two weeks, they showed signs of a stronger immune system, which the researchers said could explain why the tea helps the body fight off colds and infections. Researchers are excited not only about chamomile's health benefits, but its potential in skin care. Many active ingredients in chamomile are powerful, including the flavonoids apigenin, luteolin, and quercetin, and the volatile oils including alpha-bisabolol and matricin. These constituents all contribute to chamomile's antioxidant properties. Overall? Chamomile is calming and soothing. Temporary irritation relief: Applied topically, chamomile oil is known to temporarily calm occasional red, dry, and irritated skin. Anti-aging: Like most herbs and natural extracts, chamomile has antioxidants that help protect the skin from environmental stressors. Baby and fragile skin care: Because chamomile is so soothing, it's appropriate for using on fragile skin or even on baby's skin. Anti-itching: Whether you have bug bites or other occasional skin irritations chamomile may help. In any product, chamomile can impart soothing and calming effects. Its a good addition to cleansers, and its antioxidant effects are perfect in anti-aging formulas. Wherever you find it, you can be sure that chamomile will help your skin to emerge calmer and healthier than before. Do you use chamomile for its health benefits as well as its skin benefits? Do you drink chamomile tea? Photo courtesy Mateusz Dutkiewicz via Flickr.com. Ogata-Ikeda I, et al., “Cytotoxic action of bisabololoxide A of German chamomile on human leukemia K562 cells in combination with 5-fluorouracil,” Phytomedicine 2011 Mar 15;18(5):362-5, http://www.ncbi.nlm.nih.gov/pubmed/20863677. American Chemical Society (2005, January 4). Chamomile Tea: New Evidence Supports Health Benefits. ScienceDaily. Retrieved September 10, 2012, from http://www.sciencedaily.com­ /releases/2005/01/050104112140.htm. University of Maryland Medical Center, “German Chamomile,” http://www.umm.edu/altmed/articles/german-chamomile-000232.htm. eVitamins, “What is Chamomile?” http://www.evitamins.com/encyclopedia/assets/nutritional-supplement/chamomile/how-it-works.